Claiming around 610,000 lives each year, heart disease is the No. 1 killer of both men and women in the U.S. Did you know that research has found a link between this deadly disease and the health of your gums? Treating gum disease can go a long way in lessening the impact of coronary artery disease (CAD), according to a 2014 study in the American Journal of Preventive Medicine.1 Patients who were treated for gum disease have lower medical costs and fewer hospitalizations for CAD. 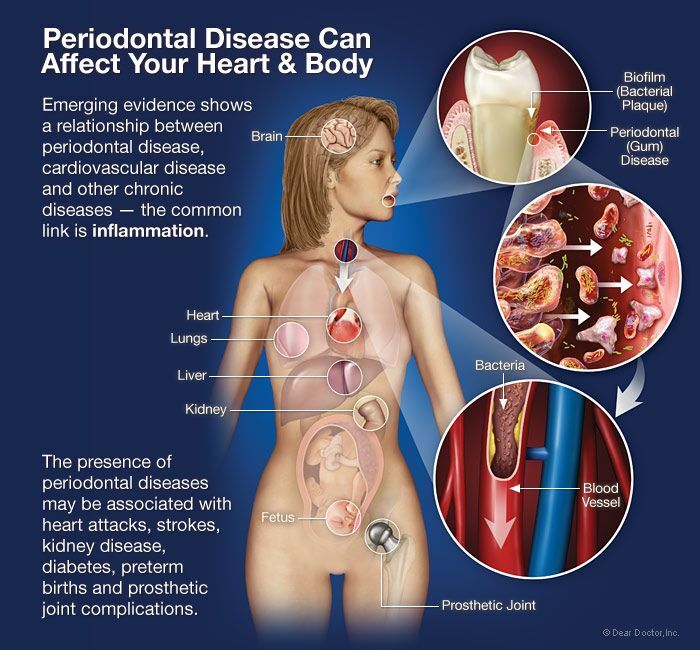 Despite the link between gum disease and heart disease, it’s not clear whether one actually causes the other, according to the American Heart Association. The two conditions have some of the same risk factors, including smoking, poor nutrition and diabetes. But even in non-smoking populations, researchers have found a strong correlation between the oral condition and heart disease. One hypothesis is that bacteria from the oral cavity spread throughout the body, worsening other inflammatory conditions, like heart disease, rheumatoid arthritis and type 2 diabetes. Regular healthy habits can lower your risk of both gum disease and heart disease. And if you already have one or both of these conditions, these strategies can help reduce their impact. Brush and floss regularly. To remove plaque-forming bacteria, brush for at least two minutes, twice a day, and don’t skip the floss. Choose a healthy diet, rich in essential nutrients (especially vitamins A and C). Reduce or eliminate sugar and starches. Avoid cigarettes and smokeless tobacco. Even smokeless tobacco can destroy your gums and increase your chance of heart disease. Visit the dentist for regular cleanings and exams. Your dentist can identify signs of systemic illness and catch gum disease early on. Always tell your dentist your medical history, current conditions and any medications you’re taking. Regular dental visits are important because they help keep your teeth and gums healthy. You should have a regular dental visit at least every 6 months. What happens at your visit? There are 2 parts to a regular dental visit. One part is the check-up. The other is the cleaning. Your dental professional will check for cavities and to see if there is plaque or tartar on your teeth. Plaque is a clear, sticky layer of bacteria. If it is not removed, it can harden and become tartar. You cannot remove tartar with brushing and flossing. If plaque and tartar build up on your teeth, they can cause oral diseases. Next, your gums will be checked. This will be done with a special tool to measure the spaces between your teeth and gums. With healthy gums, the spaces are shallow. When people have gum disease, the spaces may become deeper. The check-up should also include your tongue, throat, face, head, and neck. This is to look for any signs of trouble, swelling, or cancer. Brushing and flossing help clean the plaque from your teeth, but you can’t remove tartar at home. During the cleaning, your dental professional will use special tools to remove tartar. This is called scaling. After your teeth are scaled, they may be polished. In most cases, a gritty paste is used for this. It helps to remove any surface stains on your teeth. The final step is flossing. Your dental professional will use floss to make sure the areas between your teeth are clean. Be sure to take care of your teeth and gums between regular dental visits. Plaque is always forming on your teeth, but you can get rid of it by brushing and flossing regularly. Here are some tips for good oral care at home. Brush your teeth at least twice a day. Be sure to use a toothpaste that contains fluoride. Use a mouth rinse to help get rid of plaque bacteria. This will also help to freshen breath. During the check-up, your dental professional will check your overall oral health for any trouble areas. During the cleaning, your dental professional will remove any plaque and tartar buildup and may polish your teeth. You should have a regular dental visit at least twice a year.